I think that geezer skiers often engage in volunteer activities that intersect with their skiing passion but do not interfere with the winter activities. I effectively manage my volunteer interests so they do not impinge on my freedom to go skiing. My volunteer commitments are arranged to occur on afternoons or evenings. This frees up my mornings to get the best of conditions of powder and or grooming on the local ski slopes. I am delighted to get the best of both worlds. 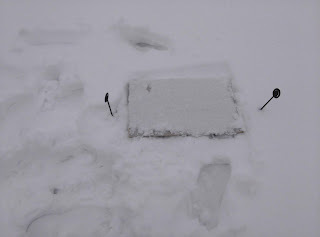 Because I enjoy the snow, I recently got training from the National Weather Service to qualify as a SKYWARN reporter. This means I am able to report snowfall and other weather phenomena to assist the Weather Service information for the region. The November snowfalls have given me practice in reporting. The photos below show my snowboard (not the downhill type) that is the reference point for my measurements. 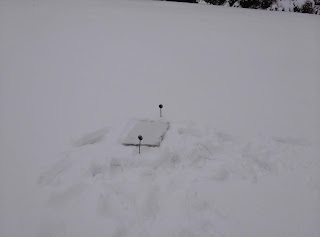 As each new snowfall occurs I measure first and then place it on the new fallen snow to prepare for the next event. I find this fun and an intersection with my skiing interest. Many of my retired geezer friends manage their intersections of skiing with volunteering in similar ways. To my retired geezer skier readers, I urge you to find volunteer activities that are fulfilling and do not interfere with your skiing passion. However, be careful not to overload your days. My current volunteer diversions beyond snow reporting include, Blood Transport Specialist for the Red Cross, guide at the Living History Museum of Central New York and beginning training for the Volunteer Income Tax Assistance program. If any of you readers out there are bored, I encourage you to get involved in your community and the Red Cross always needs new blood (pun intended). Markers Help Me Find My Board. Tomorrow is Thanksgiving and a time to reflect on the many blessings I have received not only recently but over the years. For the moment I will emphasize the blessings derived from my years of skiing. I was fortunate enough to retire completely at age 61 a full 22 years ago. Retirement didn't mean ceasing to do anything useful. There were and continue to be many volunteer activities. There are always needs out there that can be fulfilled by those of us who are fortunate enough to be healthy enough to give back in a myriad of ways. However, while I enjoy volunteer activities I am also passionate about skiing. This passion has kept me happy and healthy through 22 ski seasons with an average of 77 days of skiing per season. During that period I only had a couple of seasons when health issues interfered. The least number of days was 40 and the most 103! Therefore it is clear I am immensely appreciative of those times. Fortunately, I had only one injury that shortened my season a bit. One of the greatest blessing of skiing beyond the thrill of downhill traverses is the camaraderie of friends of the same passion for the sport. Coffee breaks are enriched every day we are on the slopes by the stories of folks with a variety of backgrounds. Recently during the off season we have gathered each second Wednesday of the month for lunch. In this new venue we have added another dimension to our friendships. I am also blessed that my wife as a non skier can tolerate the winter season without a special need for a southern vacation. As one who grew up in the south, she has had to learn what skiers already know. You have to layer to keep warm! Who knows what the future may bring for me an my geezer friends relative to their ski days. Ultimately we may all age out of the sport in spite of our passion for the activity. Meanwhile we will be thankful for the day we have on the slopes and cherish the long friendships we have developed. My hope is that as long as I live I will be able to hit the slopes. However, I know that if that does not happen, I will have a magnificent family and a bunch of good friends to sustain me. And there are always ways to volunteer and as long as I am mentally fit I can write this blog.